With all the working parts of managing a restaurant the carpet can go unnoticed until it can't. With all the concerns of providing a sanitary place to eat restaurant carpet cleaning is absolutely necessary to provide a healthy and safe atmosphere for your customers. This picture was taken part way through a recent restaurant carpet cleaning in Tampa FL. Commercial carpets soil over time. They are designed to take a lot of abuse and hide the soil build up. Because of the gradual nature of carpet soiling restaurants can develop a high level of dirt that is concealed in high traffic areas. Chem-Dry of Tampa FL has a fantastic cleaning system to get your restaurant carpet back to like new condition. 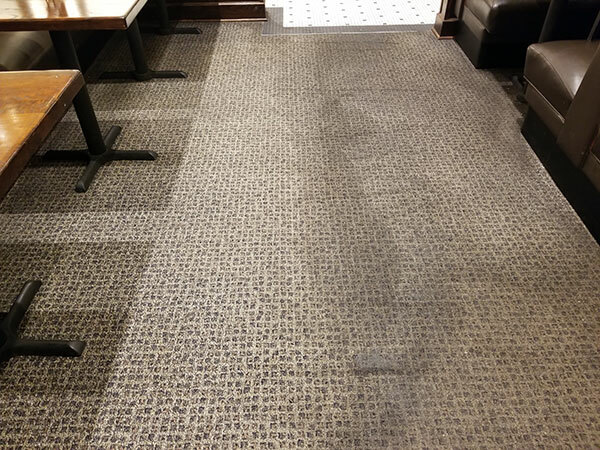 Our fast drying hot carbonated extraction cleaning is powerful enough to take on some of the toughest restaurant carpets. Traffic lane soil doesn't stand a chance. For restaurant carpet cleaning in Tampa FL call Chem-Dry of Tampa.